Welcome to Full Circle Farm, a family operated farm since 2002! Our family consists of Dennis the farmer, Alicia the wife and helper to the farmer our children: Lily, Caroline, Stella, Daniel, Mathias and Tessa. Dennis was raised Amish-Mennonite in PA and comes from a long line of dairy farmers. We believe that the way to true health is through the food you consume on a daily basis. Since your body makes 300 million new cells every 60 seconds, it makes sense to eat to support the growth of healthy cells. Your stomach lining is remade every 6 to 8 days; your skin every 30 days; your liver every 6 to 8 weeks; and your bones in about one year IF you give your body what it takes to do so. The only way to have nutrient dense foods is to grow it in mineral rich soils. Here, we grow grass in our re-mineralized/balanced soil. This is what our Devon and Jersey cows eat every day, along with a mineral mix, unrefined natural sea salt and kelp that they have access to at all times. And this is where our milk and beef comes from. We believe it is the most nutrient dense and the best value in Florida because of the care we take in building up our soil and the free choice minerals our cows have access to at all times. Not only are our cows fed mineral rich grasses but we also avoid feeding grain. Cows have four stomachs that are meant to digest grasses and when they are fed grain they are set up to allow for e-coli in the gut. Because of this we are 100% grass fed. In the winter time we MAY feed a pint of molasses and organic alfalfa pellets at milking but this usually only lasts for a few weeks. We hope to put an end to this as our soils become more balanced and can produce a better yield of green winter rye grasses. In the winter we also feed chemical free hay from our own farm that we make in the summer and fall, as well as from trusted suppliers. Cows fed grain get a condition called acidosis making their meat and milk more acid. This occurs because grain is an unnatural feed for cattle. If you would like to learn more about the detrimental affects that cottonseed meal, soy, and other conventional cattle feeds have on the health of the animal (and you) visit www.eatwild.com. Feeding 100% grass means we get a lot less milk per cow. Production averages 1 or 2 gallons per cow per day and rarely more. If grain is fed you can easily get 5 or 10 gallons per cow and thus the milk can be cheap. But we also believe there are dangers with possible GMO grain and chemicals like herbicide residues in the grain. A cow can only produce a certain amount of nutrients each day extracted from what she eats, and this amount of nutrients is spread across all of the gallons of milk she produces. This is why we call our milk nutrient-dense. The type of grain conventionally-raised cows are fed is also a concern. Cottonseed and soy have LOTS of problems of their own and their toxins pass through the cows into the milk. Most grain is tested for herbicide residues and they say it does not have them BUT that means they are below an acceptable level. What level is acceptable to you and your family? ALL or any grains alter the cow's whole body, but the cottonseed and soy are VERY VERY bad in our opinion. The book called The Whole Soy Story will enlighten you on soy. Dr Weston Price spoke against cottonseed in his timeless classic Nutrition and Physical Degeneration written in 1939. After you read these books you will NOT want to drink milk from cows eating soy or cottonseed. As of this date (8-16-2016) we have not used chemical wormers or antibiotics or added hormones or vaccines of any kind on any cow on our farm. We do not use chemical fertilizer or fly spray or herbicide or any other form of harmful chemicals whatsoever on our farm. We will/would use antibiotics on a cow or calf to save the life of the animal but very seldom need to as we focus instead on health of the animals. Keeping them healthy and preventing problems is our focus AND provides us with the nutrient dense foods we want and our bodies need. Also we do not just put out token kelp occasionally to say we feed it, we try very hard to keep it in front of the cows all the time. We pasture our laying flock of Rhode Island Reds, Black Australorps, and Barred Rocks with a chicken tractor which is moved every 2-5 days. Notice the bright orange yolks on those eggs! The hens on our farm our also supplemented with a Non-GMO verified feed. All of the chicken we sell is from pastured broilers and either fed a Non- GMO verified feed or a NON-GMO verified, Soy free feed. We have partnered with Eden Farm who produces all the different cut up chicken parts that we sell as well as producing the Non-GMO, soy free feed chicken that we sell. Ben is our on farm partner and manager of our pork operation. Our pigs are forest-raised from the time we get them as piglets. Rooting and running about, they get about half of their nutrition from the vegetation of the forest. The other half comes from GMO-free feed. Try a pack of fresh sausage links to get started; the flavor is truly incredible! We love visitors and giving tours; e-mail us at fullcirclerealfoods@gmail.com and we will set up a time. Here are videos introducing our farm, by Justin Rhodes. To watch in order of when they were published you can start from the last video at the bottom of this page and go up. 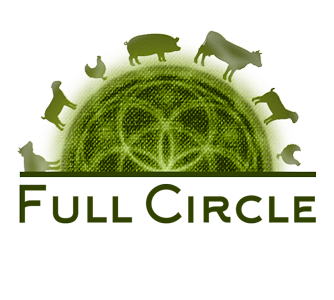 You can watch the Full Circle Farm Intro Video first, then you can start from the bottom of this page and scroll upwards to view each video. We hope you enjoy, thank you for watching!